I put off writing this week, waiting for something inspiring to happen. We just made it through Holy Week and Easter – an ample supply of God moments! But now it feels as if my eyes have been closed. This week it seemed that I spent more time fighting with my 3-year-old than experiencing moments of love with our family. This week I found myself lost in the schedule and far too focused on the next task to pay attention to what God was doing. Sure, there are little stories from the week – little moments of grace and God’s love at work. But no earth shattering, captivating stories to share! Sunday morning arrives and I have nothing to write about. When I reach this point, I feel that I’ve failed! I know God is present – I say the words every week. By now, 2 years in, I should be so observant of God’s presence that I am forced to pick and choose from many writing options each week! 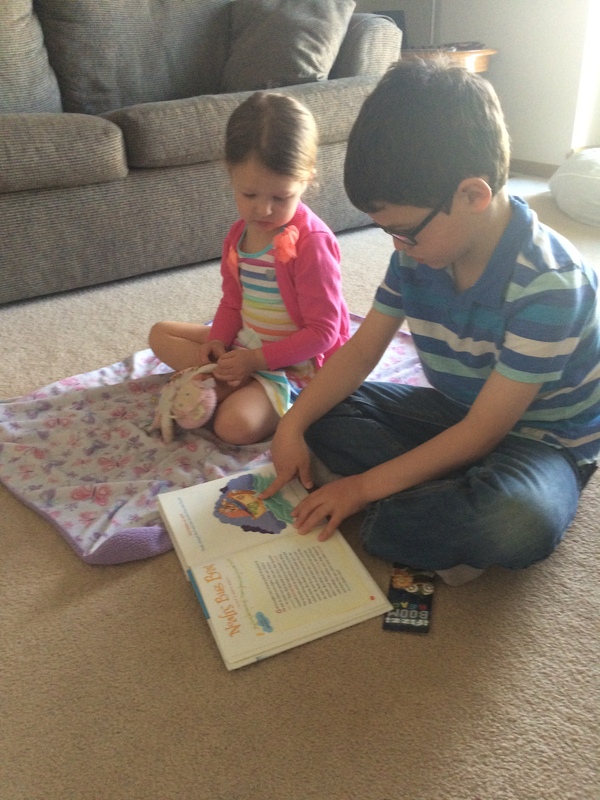 My son and daughter sit on the floor together with their children’s story Bible in front of them. A CD is playing, with songs that connect to each story. They are engaged in the story. They sing, they get up and dance. They are together, taking time to learn about and experience God just because they want to. No coercion from mom and dad! It was a simple moment – still not the exciting, earth shattering story I was seeking. The event will not captivate readers. But in that moment, God showed me what I needed to see. I was reminded that it is these little moments I need to keep my eyes open for! When I wait around for that big story, I miss the beautiful little moments our family shares. My family yearns to continually grow in faith. We try to serve others and spread the good news of a loving God. We seek God’s presence. We do all of these things every single day. But at the same time, we fail at these things every day! And that is OK. We move forward – we continue to seek God’s presence together – in big and small ways! Categories: Family | Tags: Bible, children, faith, family, God, parenting, witness, writing | Permalink. Oh Brooke, you’re not missing it at all. And those ways might seem “small,” but when God is in them, they’re huge! And when you share them, they’re amazing! Thank you! You are so good at this! Thanks for sharing!! Thank you, thank you Renae! You have read these faithfully and I appreciate your support, prayers and encouragement more than I can say!